WUXGA resolution + IPS: the choice of professionals. WUXGA resolution (1920x1200) has 11% more vertical workspace than 1080p monitors (1920x1080). The 16:10 aspect ratio (instead of 16:9) lets you see more at a glance without scrolling. 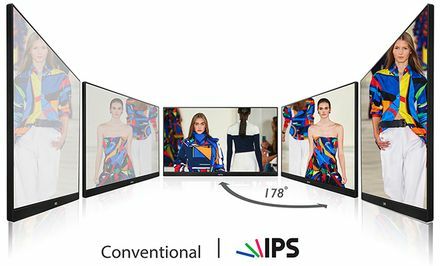 Meanwhile, IPS technology reduces color shift at oblique angles, crtical for a multi-screen array. Optimal triple-monitor productivity: a primary application in landscape mode flanked by supporting content in portrait mode. Portrait mode enables documents and web pages to be displayed in full without scrolling. The configuration also uses less desk space. QHD (2560x1440): 78% more workspace than 1080p resolution (1920x1080). See more trading indicators, spreadsheet rows/columns and web pages at a glance without scrolling, and view images and documents with better clarity. Virtual monitors and flexible layouts: Use UltraView Desktop Manager software (included) to split each screen into multiple virtual monitors. Save preferred layouts as profiles and toggle between them as needed for your work. 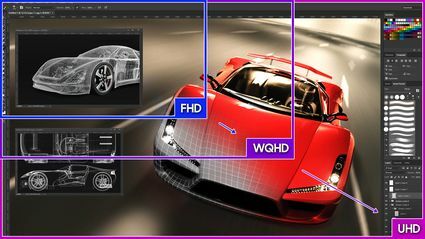 Extra large screens and larger pixel pitch are easy on the eyes, enabling the same native text size as popular 23.8″ FHD 1080p monitors, but now with 78% larger workspace — thanks to QHD resolution (2560×1440 per screen). 50-megapixel desktop: the equivalent workspace of 24 FHD 1080p monitors!